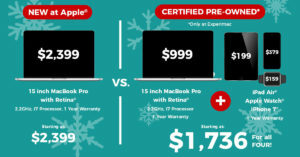 Get more for your money at Experimac! Why pay top dollar for one device from a big box store this holiday season when you can buy two, or three, or four – and still pay less! 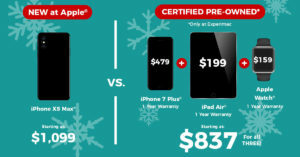 Experimac is the home of the Certified Pre-owned Apple® products that are affordable for everyone on your list. MacBooks, iPhones, iPads, Apple Watches, cases, keyboards, accessories and more – all at your local Experimac, and all at a jolly ol’ price point. Imagine that – put more under the tree and keep more in your pocket! 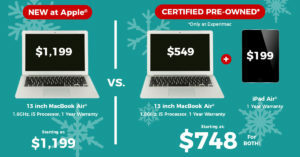 At Experimac, you can save so much money that you’re guaranteed to be on the nice list! 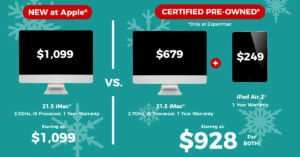 Check out some of the comparisons below to see the type of savings* that may be available at your local Experimac! *This is a representation of the types of products that are available at Experimac. Due to changing inventory, these exact models may not be available at all times. Contact your local Experimac for available inventory.